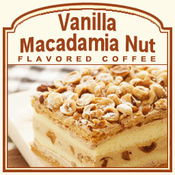 Macadamia nuts are known for being buttery and subtly creamy with their nutty undertones, which is why this flavored Vanilla Macadamia Nut coffee is a delicious collaboration of fresh roasted coffee and flavoring. As the vanilla coats your taste buds with sweetness, the macadamia nut flavor will offer a thick, buttery goodness. With only 2 calories in each cup, this hearty Vanilla Macadamia Nut flavored coffee will offer you a true gourmet coffee experience with its 100% authentic Arabica beans and perfectly roasted flavor. Freshly roasted and shipped on the same day, the Vanilla Macadamia Nut flavored coffee will enlighten all of your senses with its delightful aroma. Experience this combination of classic flavor and order our Vanilla Macadamia Nut flavored coffee. Packaged in a heat-sealed valve bag, the subtle, buttery undertones and smoothly-rich, vanilla essence of our gourmet flavored coffee is preserved and delivered absolutely fresh!